..usually go very well together, except when a glass of the red wine in question gets knocked over and stains a pile of cream coloured fabric onto which you have just stencilled the roses. Fortunately google had a remedy which utilized stuff I had at home and the resulting stains became so faint that in the end I decided to leave them. I did swear a bit though. Anyway, I don't think I've shown any of this project. It's something I can do with hordes of kids around, so I made good progress over the holidays. I have always loved this Alabama Chanin wrap top, and having the skills required to create the pattern meant it was easy to make one of my own. I'm very happy with the front, but I think I could improve the fit at the back. It's a little loose around the waist. Next time (of course there will be a next time, there always is) I will probably deepen the armholes slightly and I may take in the CB a little. Or not, looser clothes are comfy, and leave room for the layers needed for a large part of the year and these 100% cotton knit garments give with wear, and the armhole may well not need adjustment. And now it's time to panic because I do not have my next Alabama Chanin project lined up, and I get pretty antsy without one on the go at all times! I'm proceeding with all the pace of a turtle stampeding through peanut butter at the moment. I'm posting this mostly because I really really want to get that "Why yes, I have had five children, how can you tell?" midriff shot off the top of the page! My Nougat currently looks like this. Front bodice panels all joined apart from the centre, nothing pressed. sorry for the wonky angle, I clearly can't hold a camera straight. You can see that I've done away with the waist seam. 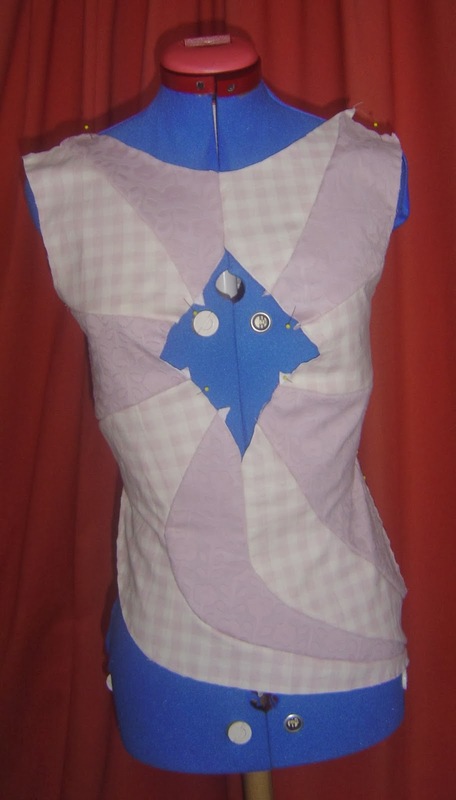 I'm not keen on waist seams, and figured that I could probably align the bodice and yoke pieces and eliminate it. They look like this. One minor problem I've found with this pattern is that some of them didn't match. The side seam on bodice and yoke didn't match. This was very easy to fix, and no big deal. (I just added to the bodice seam line to compensate.) Over the length of an entire waistline you'd just ease in the tiny bit extra, but in such a short panel length it would be less straightforward. I mentioned in my last post that I'd lower the waistline. I did it like this. 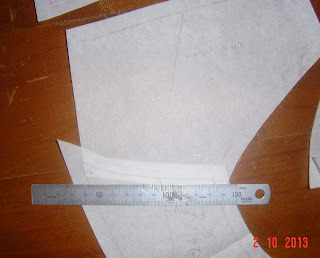 I drew a line perpendicular to the centre front, starting at the waistline (because that was where the lines I'd be crossing seemed easiest to alter) traced the bodice to that line, then slid the paper up 1.5cm and traced the bottom. 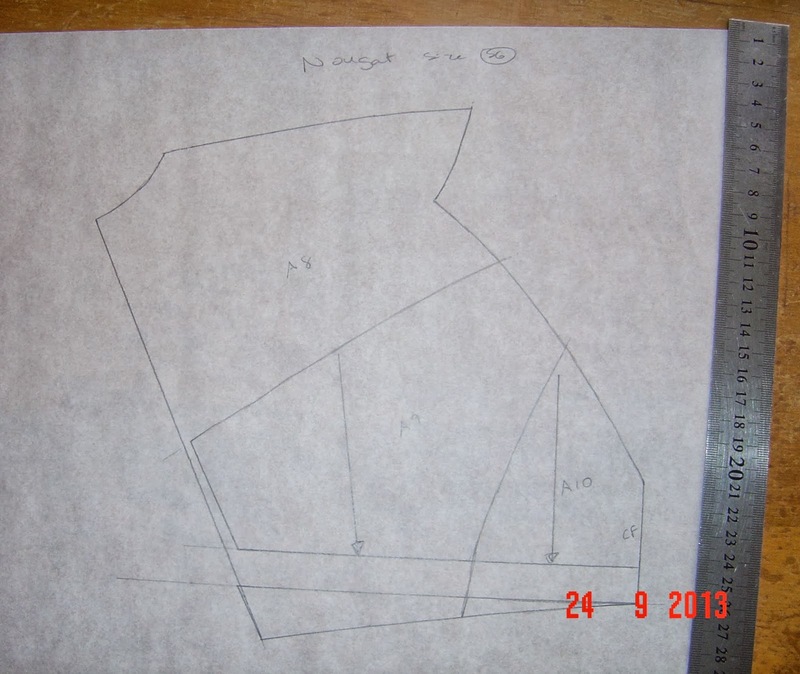 Then I had to true the lines and make sure that panels would meet at the seam lines. With all the panel seam lines this required a bit of care and attention, but worked just fine. I did one more toile to check, but didn't take a pic of it on me. It was perfect. There is one other problem with the pattern that I have found. The yoke pieces for the back are labelled E1-4, and they should be E4-1, if that makes sense. 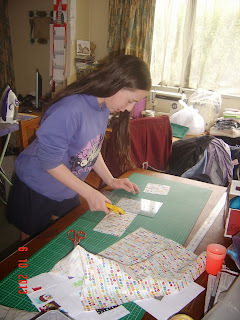 As far as I can tell the pattern instructions have them correctly labelled, but the pattern sheet has them mislabelled. They work perfectly, and the only problem is that if you are using two different fabrics the "Fabric A" and "Fabric B" labels are transposed. I really don't want to be negative about this pattern. It is a gorgeous, complex, pattern, and these are incredibly minor issues. I'm mentioning them only as feedback to AnaJan and just in case anyone reading this finds them helpful. Here are two of the many, many, many things causing me delays. 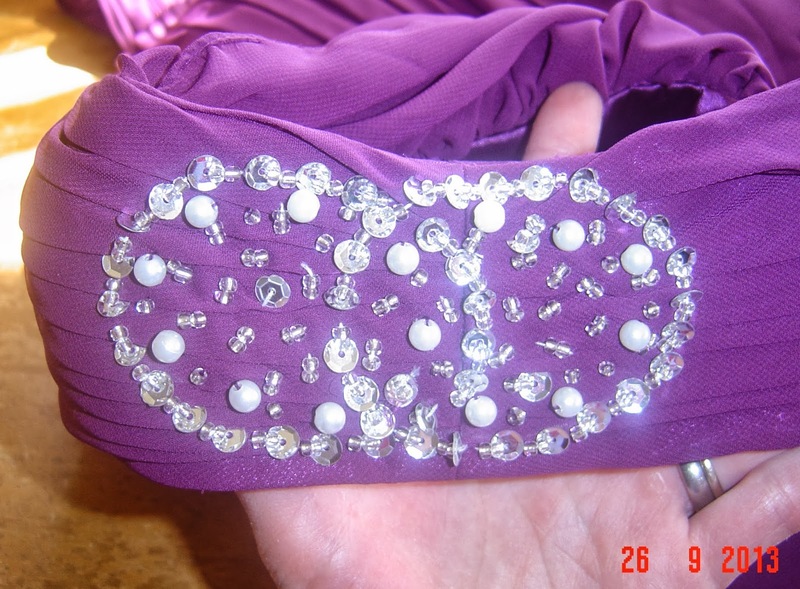 Keely's daughter bought a formal dress online, which arrived on Tuesday for a Saturday formal. It needed altering, and they had me on standby! Keely is on a very very short list of people who'd get 10+ hours of my time and expertise with that tight a deadline! they came over with the dress on Wednesday so I could start, then Thursday with shoes to mark the hem, then Friday to collect. PHEW! 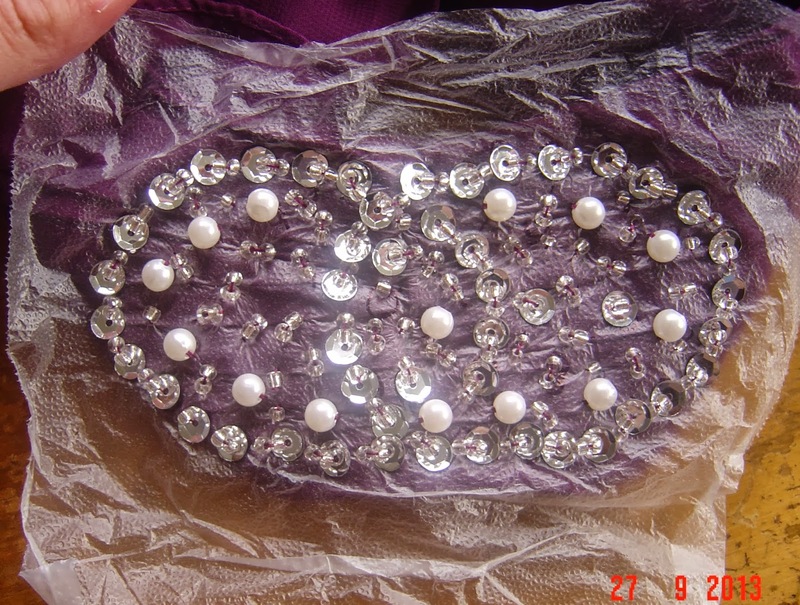 The bodice was too long, and needed a simple reduction in length at the shoulder. Easy. Apart from this. 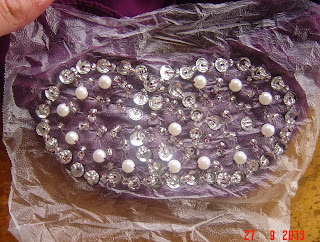 I needed to take off the beads, take up the shoulder, and resew them. 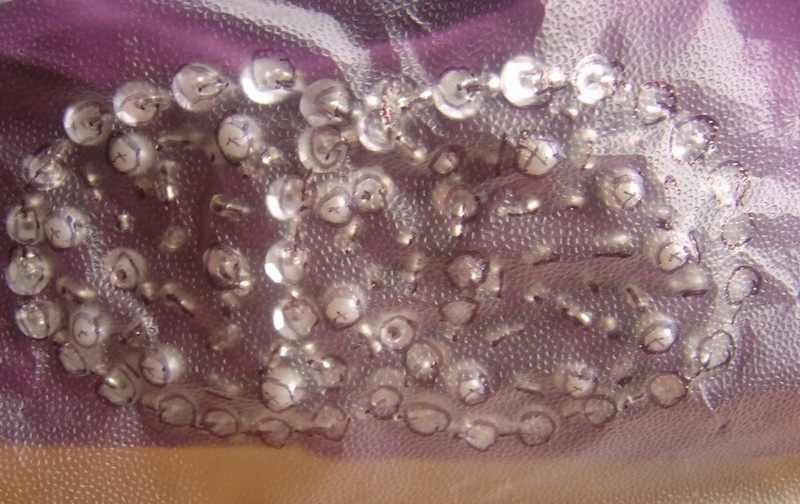 In one of my prouder moments I thought of pressing press'n'seal onto the beads and marking where they were. Then after the shoulder alteration I just sewed them back on through the press'n'seal, which pulls out leaving no residue. Easy!